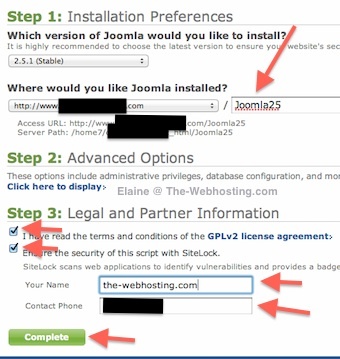 Installing Joomla 2.5 on Bluehost is very easy and fast. Bluehost has the one-click-installs which eliminates all need to know anything about creating a MySQL Database, creating a MySQL Database user, finding the database hostname, entering in the MySQL db user password and other Installation details which always cause problems when Installing Joomla manually. Bluehost always has the latest version of Joomla available for Installation. Bluehost has One Click Installs which help you install Joomla 2.5 in seconds. The name of the scripts differ between web hosting companies. Bluehost calls theirs ‘simple scripts’, others may called it ‘fantastico’ or ‘One Click Installs’. You will find that Bluehost offers many installation scripts and you can install any of the softwares for free. With one click and a few second later, you can have any type of website you want. This screen just confirms that you want to Install Joomla 2.5.1 and also allows you to choose if you want to Install the ‘Sample Data’ that comes along with Joomla. As of Joomla 1.5 you have a choice if you want to install the Sample data. Here you just specify which directory you want to install Joomla 2.5 in. You also just click on the legal information checkboxes and enter you name for identification verification requirements. You are home free. Bluehost will install Joomla 2.5 for you and you can just sit back and watch the percentage complete progress bar. If there are any issues with the data provided in the previous screen an error will show up. Usually if the directory you selected is not empty or installation already exists in that directory, you will get a warning error message. In that case, go through the installation process again and select a different subdirectory in Step 4 – Where would you like Joomla Installed? With Bluehost simple script installation of Joomla 2.5, it’s very easy. There are less chance of errors and save you tons of time. There is a lot of frustration that goes along with installating Joomla manually, but Bluehost takes all that out. I installed Joomla 2.5.1 in about 5 minutes with Bluehost ‘Simple Scripts’ but I think it would take me about 15-20 minutes with a manual install. 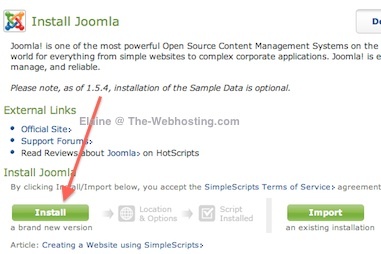 Previous post: Which Webhosting Has Joomla 2.5 One Click Installs?